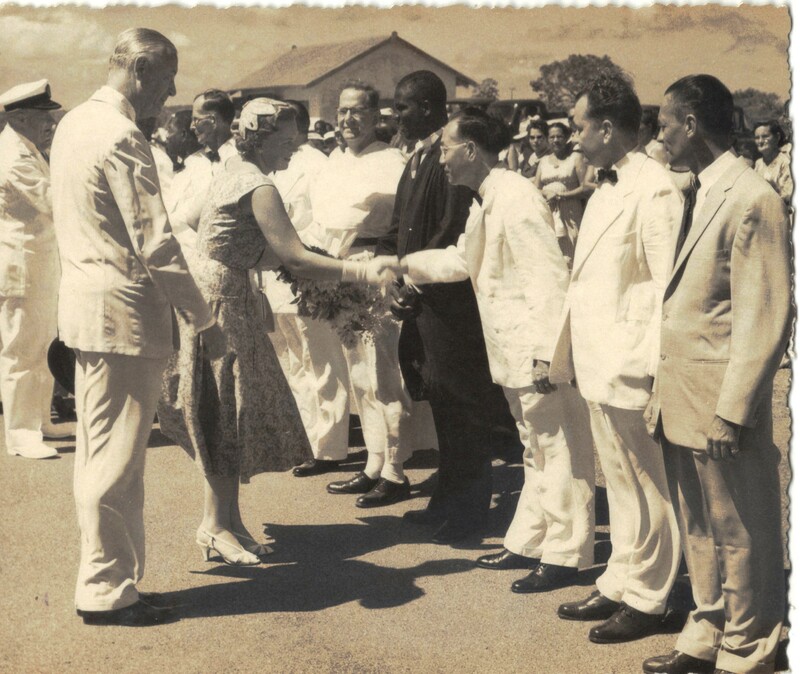 To far right my boss Joseph Alphonse Constantine O’Connor in line to greet Her Royal Highness Crown Princess Beatrix in 1955 at the old St. Maarten airport. Joseph Alphonse Constantine O’Connor better known as “Fons” was born October 1st 1920 and died on February 9th, 1994. The first time I saw him was on entering the harbor of Great Bay with Capt. Matthew Levenston on his sloop the “Gloria”. A piece of flotsam made it at times quicker from Saba to St. Maarten than the “Gloria” did. And as usual we were several hours late when we arrived in the harbor. The year was 1955. One which was to leave deep impressions on me, and the year in which I first met “Fons”. He was in his “speedboat” which at the time was a locally built wooden fishing boat with a 20 horsepower Johnson outboard engine. Being that it was a Sunday afternoon Fons was in his cups and decided to play a sort of Russian roulette with the “Gloria” by constantly cutting in front of the bow of the sloop. No need to fear a collision however as the “Gloria’s” two speeds were “dead slow” and “full stop”. Nevertheless Capt. Matthew was quite upset as each time that Fons made his maneuver it was accompanied by a stream of bad words impinging on the captain’s maternal ancestry, and other foul mouthed accusations which had become a standard part of West Indian vocabulary long before Eddie Murphy was born. Especially white West Indians seemed to have refined the art of using bad words as if to make up for less physical strength than their brethren of African ancestry. The two storied building on the right was the home of the O’Connor family in former times. This photo is from the nineteen thirties. Fons’ show was in his way of thinking done in good faith as he and the Captain were good personal friends otherwise. And all Matthew could say was:” And look you cannot even curse the man back because he is the Judge and might lock you to hell up.” So we gave up on advising Matthew “Cuss he mother back Matthew!” Obviously it was no use as Matthew did not use curse words and he was not going to take that sort of chance with the Judge. It was several years later when on completing my schooling on Curacao that I opted for a public service career on St. Maarten. 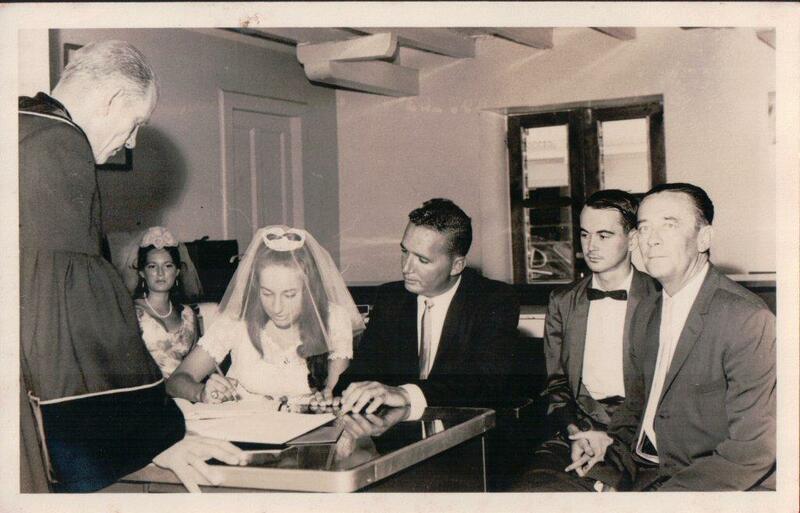 The fateful day that I was again to meet with Fons was October 10th, 1960. Lt. Governor “Japa” Beaujon after reprimanding me about coming to my first day of work with rolled up shirt sleeves, sent me down to report to the Courthouse and to my future boss Fons O’Connor. If you wanted to get him real mad all you had to do was to spell his last name as Conner or Connor. Wars had been fought over lesser offences than to misspell the name of O’Connor if you were to believe Fons. Anyway I parked myself in front of the then Monument on the square anxiously awaiting my new job. Another long deceased old friend Lorenzo de Lain who used to ring the bell on the hour at the Courthouse suggested that I stand under the awning of the building as “St. Maarten people don’t like Saba people.” And with what little traffic there was at the time “someone might try to knock you down.” At the time I did not know he was pulling my leg of course and that St. Maarten people liked Saba people to the extent that Lorenzo himself had fathered a son by a Saban lady. M-50 the blue Buick parked up in front of the home of my boss Fons and the Courthouse was only a stones throw away from his home. And traffic was so slow then that you hardly ran a risk of being run over. Michel Deher told me an embarrassing episode in his early childhood life when St. Maarten lost yet another battle to Curacao. 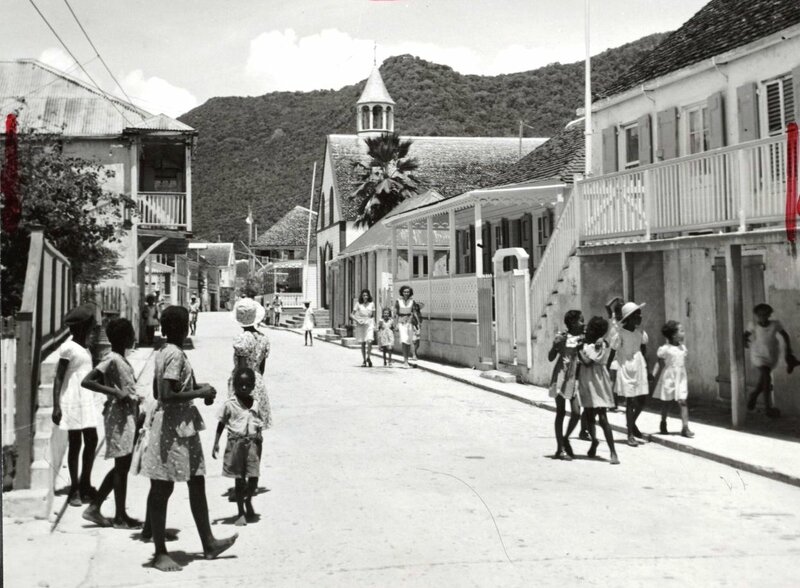 Down by the Sea View Hotel opposite Maude Flanders house he and some other boys had been arguing with a Curacao official Schotborgh the Receiver, that St. Maarten had more cars than Curacao. “Oh yeah” said the official, “I’ll bet you a guilder (big money back then) that if you lie down on the street that a car won’t pass in half-an-hour.” Michel said that after negotiating for another half hour, and nearly sun stroked they gave up after an hour and a half of lying on the street. 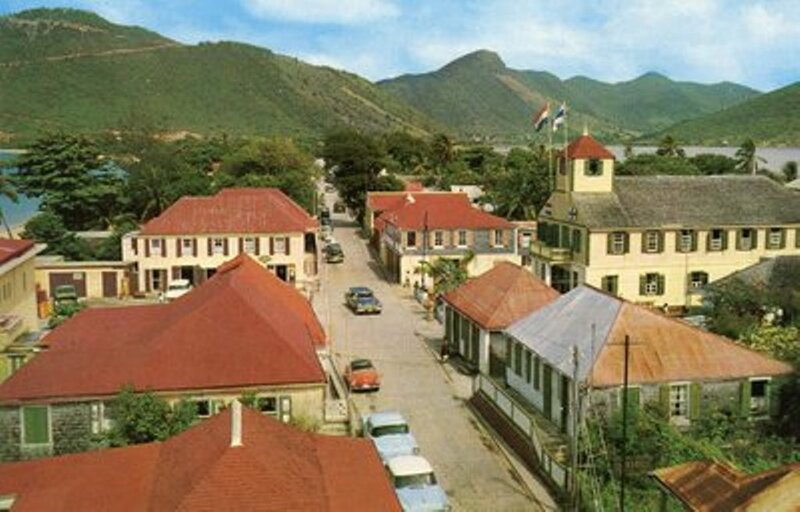 He said that he was unaware of any car passing down the Front Street at all that day, and Michael was very careful after that to make comparisons between Curacao and St. Maarten. By the time Fons did show up, Arnold Scott, Laurel Peterson, Jimmy Halley, Whitfield Vlaun and Sonny Boy Lake had already taken charge of me and I was busy sorting out mail in the back. Even Eugene de Lain (“Mr. Bush”) who had just retired as the mail delivery man had come along and met the new boy from Saba who had just come from Curacao school. Wedding ceremony conducted by Civil Registrar the Hon. Constant Williams. 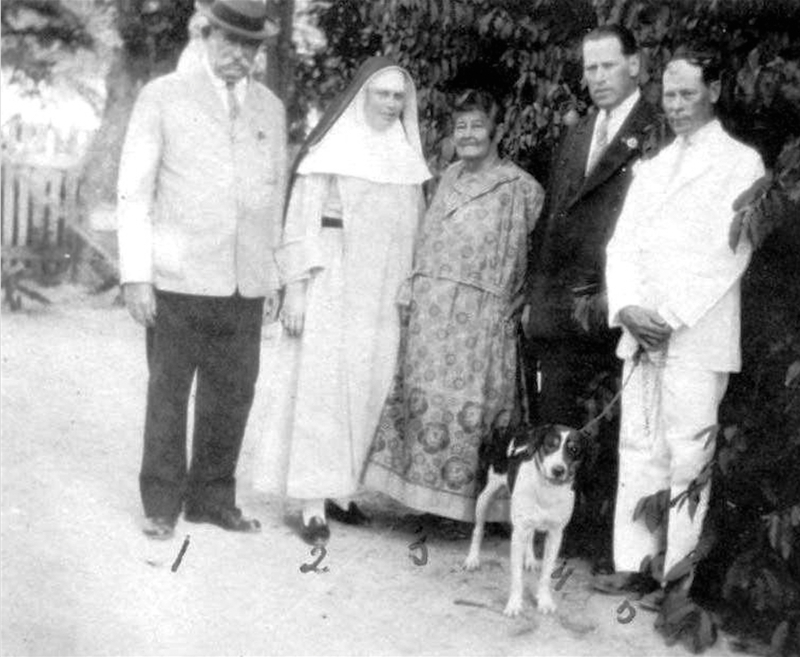 Left to right Joseph Alphonse Constantine O’Connor, Will Johnson, groom Antonio Velasquez, bride Sheri Batson and witness Ruth Velasquez. 1960’s. 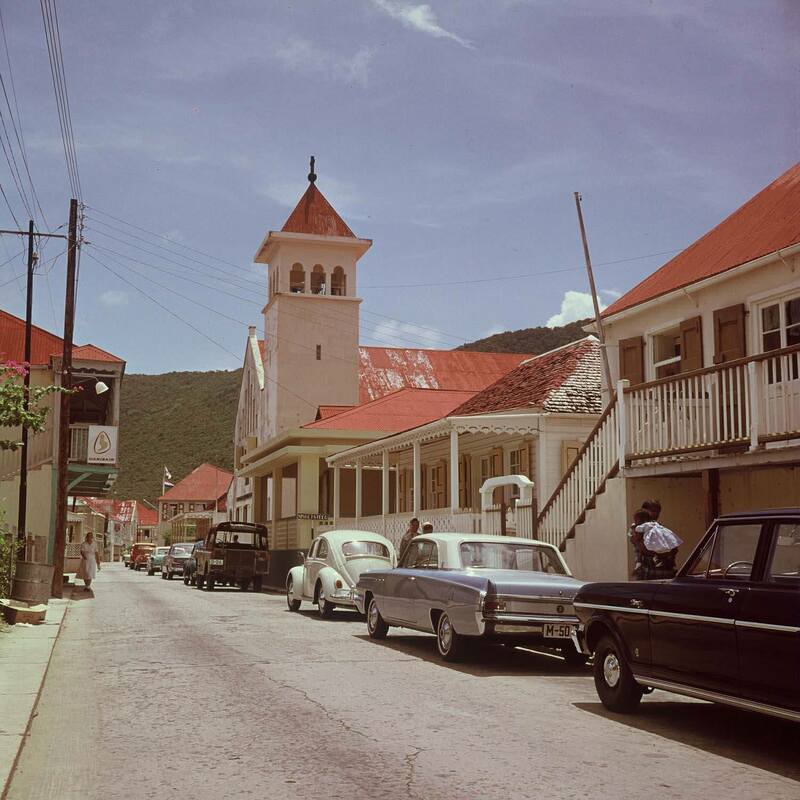 Fons’ Buick M-50 parked up in front of his house in Philipsburg 1960. Fons was a bon vivant and I remember once he told me that the next best product from America which he favored most aftera Buick was an American woman. He loved a Buick. After threatening to shoot certain private parts of my poor old lady (literally translated from the offensive) he took off in the direction of the street with his new found red head to his most favored means of transportation the Buick. The stories which circulated about Fons and his harassment of the town’s residents with his ungodly late night (10 and 11 o’clock back then) hours of speeding around the town are legion. Clatter’d a hundred steeds along. 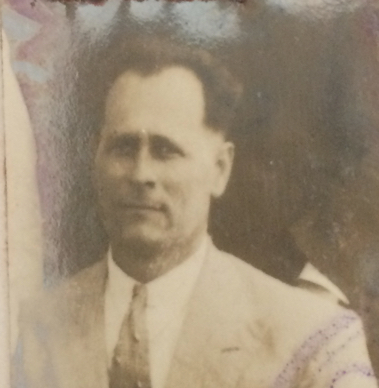 William O’Connor (1941) Fons’ father. Before the Buick he had a fancy for motorcycles. Once when coming from Marigot with the Captain of a K.N.S.M. boat on the motorcycle Fons lost him somewhere in the vicinity of the border monument. Only after passing through Cole Bay and heading up the hill, did he notice that he was minus a passenger. Fons who was not partial to his own ancestral maternal origins exclaimed “Oh me mother’s etc., I lost the (you know what or at least you can guess) Dutchman, and he headed back to pick him up stunned, bruised but alive and walking along the road. Sydney Lejuez used to tell me how his father Roy was laboring one day with a large fish net on his head coming from “The Corner” in Simpson bay headed in the direction of Great Bay. Under a cloud of dust Fons drove up and shouted out to Roy “Get your old backside on the back.” Balancing between hell and the deep blue sea Roy was asked if he was frightened and when smelling hesitation on Roy’s part, which Fons interpreted for fear, only then Fons picked up speed, Choosing between living to raise his many children or a certain death on Fons’ motorcycle, Roy threw caution to the wind and dumped his net overboard. “Lawd Fons me net fall down.” Without slowing down Fons made a sharp turn and headed back in the direction of the net. After kneeling down and thanking God for a safe landing Roy decided that even if it took him a month to reach Great Bay and should he even face starvation on the way it was better than taking a chance with Fons on his motorcycle. Members of the O’Connor family. 1. William Frederick O’Connor (b.1860 d. 1945) 2. Sister Maria Arcadia – Amaria Wilhelmina O’Connor b. 1902 3. Margaret Maria Fletcher Williams b. +_ 1862 – 2nd wife of # 1 4. William Adolph O’Connor b. 1888 “Uncle Willy” 5. Charles Wilfred O’Connor b. 1882 “Uncle Fred”. I was later to learn that Fons’ drinking and cussin’ was only to cover up a real shy and nice person. After my encounter with Fons at the Pasangrahan, I decided it would be better to cut my losses early and head back to Saba and if need be fish for a living rather than face the wrath of Fons on Monday. But it was not necessary. Fons when he did come in to work never even noticed me, and not until the next bullfight at the St. John’s Ranch when in his fraternal manner he greeted me as “You (copulating pygmy illegitimate offspring of an unwedded mother who accepts cash for favors rendered etc.) I frightened you eh!’ When I learned to know the real Fons and I didn’t back down, Claude Wathey when he was pissed at something I had allegedly done would shout at Fons in the Lido bar “who the hell is the boss at the Courthouse, you or that so and so Will Johnson?) Claude could curse a bad word too when he wanted. Suddenly Fons decided to throw in the towel. Captivated by a young Dutch schoolmarm the old cowboy put up his guns, retired his Buick and chose to live a quiet life in the country and to raise his kids. Hang up his guns he did. That is yet another story. Fons was always at war with his neighbor the American named Gordon who ran the Lido Hotel next door to his house. When his favorite Labrador dog named Lion died Fons accused Gordon of poisoning him of course. It did not matter that Lion had already set several records for longevity of the canine species, any excuse would do to run Gordon out of town. The bartender Calvin Lake who had been to school with me on Curacao told me this one.) If Claude Wathey and Clem Labega had not been there the night when Fons entered the Lido bar with two loaded 38 specials at his side and with more ammunition than Pancho Villa had when he attacked Uncle Sam, blood would still be oozing out on the square if Fons had been allowed to carry out his threats. When I later entered politics and left St. Maarten we kept in touch. When he retired from government service as Notary, Postmaster, Judge, Receiver, Marshall, Customs Chief Etc. he joined Windward Island Bank where he worked for a number of years while raising his children. He visited me once on Saba and it was remarkable to see Fons domesticated. Yet that he was and most people only remember the domesticated Fons, and not the wild man we all knew and loved. I saw him at Bobby’s Marina just a week before he died and I gave him a lift to the supermarket next to the “Vineyard”. He was walking with a cane and told me he was living temporarily at the St. Martin’s Home. When I left Fons, little did I know it would be the last time I would see him. The last thing he said to me was:’ wish you luck with the elections, but I know you going to beat them anyway.” The night of my big political rally on Saba with Mrs. Maria Liberia-Peters and Capt. Leo Chance present, one of my brothers informed me that “Fons Conner “had died. It did not register on me until a friend at Windward islands Bank informed me that she had just returned from Fons’ funeral and a flood of memories of Fons came back which I am now committing to paper. With each old friend going to their graves many years of good memories go with them. One final note from his youth. Did you know that Fons could sing? Yep, that he could. Unprintable lyrics of course, but sing them he did. I cannot remember the lyrics and even if I did I could not commit them to paper, especially now that the clergy are down on calypsonians and the compositions of their songs.